Third ventricle wall in the brain of an immature rat. A tanycyte coexpressing CuZn SOD and GFAP is marked by the arrow. Tanycytes are special ependymal cells found in the third ventricle of the brain, and on the floor of the fourth ventricle and have processes extending deep into the hypothalamus. It is possible that their function is to transfer chemical signals from the cerebrospinal fluid (CSF) to the central nervous system (CNS). The term tanycyte comes from the Greek word tanus which means elongated. Tanycytes share some features with radial glia cells and astrocytes. Their form and location have led some authors to regard them as radial glia cells that remain in the hypothalamus throughout life. This has led some to believe that these cells share the same lineage. Even so, tanycytes also display certain characteristics that distinguish them from radial glia cells. Tanycytes in rats begin to develop in the last two days of pregnancy and continue on until they reach their full differentiation in the first month of life. Radial glia cells on the other hand, are a key component of the embryonic brain. Tanycytes also contain many proteins not found in radial glia cells. Thus, evidence now suggests that tanycytes are genealogical descendants of radial glia cells that do not develop into astrocytes, but rather into their own subpopulation. Tanycytes in adult mammals are found in the ventricular system and the circumventricular organs. They are most numerous in the third ventricle of the brain, but can also be seen in the spinal cord radiating from the ependyma of the central canal to the spinal cord surface. Tanycytes represent approximately 0.6% of the population of the lateral ventricular wall, as described by Doetsch et al. Tanycytes have also been shown in vivo to serve as a diet-responsive neurogenic niche. Recent work  suggests that tanycyte cells bridge the gap between the central nervous system (CNS) via cerebrospinal fluid (CSF) to the hypophyseal portal blood. This may also link the CSF to neuroendocrine events. Recent research  found that tanycytes participate in the release of gonadotropic hormone-releasing hormone (GnRH). GnRH is released by neurons located in the rostral hypothalamus. These nerve fibers are concentrated in the region that exactly matches the distribution of β1 tanycytes. Currently, it is thought that there are two different mechanisms by which tanycytes participate in the release of GnRH. One includes the cyclic remodeling of the spatial relationship between GnRH terminals, the tanycytes, and the perivascular space. The second is the cell to cell signaling mechanism mediated by specific tanycyte compounds. Recent evidence supports both mechanisms, and also the possibility that both are part of a single mechanism. The term tanycyte was coined by Horstmann in 1954 when he described a distinct structural feature of the cell, which is a single, long basal process that projects to a distinct region of the hypothalamus. During the 1970s and 1980s, tanycytes were the subject of many research publications, ranging from their morphology to function. But the lack of advanced methodological tools stalled research and led to disagreements between researchers about the full role of tanycytes. Recent advances in immunocytochemistry have allowed for new research in this area. ↑ Doetsch, F; García-Verdugo, JM; Alvarez-Buylla, A (Jul 1, 1997). "Cellular composition and three-dimensional organization of the subventricular germinal zone in the adult mammalian brain.". The Journal of neuroscience : the official journal of the Society for Neuroscience. 17 (13): 5046–61. PMID 9185542. ↑ Lee, DA; Bedont, JL; Pak, T; Wang, H; Song, J; Miranda-Angulo, A; Takiar, V; Charubhumi, V; Balordi, F; Takebayashi, H; Aja, S; Ford, E; Fishell, G; Blackshaw, S (Mar 25, 2012). "Tanycytes of the hypothalamic median eminence form a diet-responsive neurogenic niche.". Nature Neuroscience. 15 (5): 700–2. doi:10.1038/nn.3079. PMC 3380241 . PMID 22446882. ↑ Mullier, A; Bouret, SG; Prevot, V; Dehouck, B (Apr 1, 2010). "Differential distribution of tight junction proteins suggests a role for tanycytes in blood-hypothalamus barrier regulation in the adult mouse brain.". The Journal of Comparative Neurology. 518 (7): 943–62. doi:10.1002/cne.22273. PMC 2892518 . PMID 20127760. ↑ Langlet, F; Mullier, A; Bouret, SG; Prevot, V; Dehouck, B (Oct 15, 2013). "Tanycyte-like cells form a blood-cerebrospinal fluid barrier in the circumventricular organs of the mouse brain.". J. Comp. Neurol. 521 (15): 3389–405. doi:10.1002/cne.23355. PMID 23649873. ↑ Prevot, V; Bellefontaine, N; Baroncini, M; Sharif, A; Hanchate, NK; Parkash, J; Campagne, C; de Seranno, S (Jul 2010). 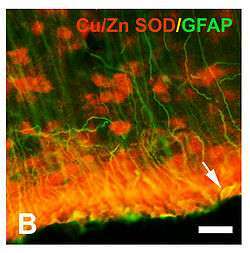 "Gonadotrophin-releasing hormone nerve terminals, tanycytes and neurohaemal junction remodelling in the adult median eminence: functional consequences for reproduction and dynamic role of vascular endothelial cells.". Journal of neuroendocrinology. 22 (7): 639–49. doi:10.1111/j.1365-2826.2010.02033.x. PMC 3168864 . PMID 20492366. Rodríguez, EM; Blázquez, JL; Pastor, FE; Peláez, B; Peña, P; Peruzzo, B; Amat, P (2005). "Hypothalamic tanycytes: a key component of brain-endocrine interaction.". International review of cytology. 247: 89–164. doi:10.1016/S0074-7696(05)47003-5. PMID 16344112. Kubota, T; Sato, K; Arishima, H; Takeuchi, H; Kitai, R; Nakagawa, T (Feb 2006). "Astroblastoma: immunohistochemical and ultrastructural study of distinctive epithelial and probable tanycytic differentiation.". Neuropathology : official journal of the Japanese Society of Neuropathology. 26 (1): 72–81. doi:10.1111/j.1440-1789.2006.00636.x. PMID 16521483. Guadaño-Ferraz, A; Obregón, MJ; St Germain, DL; Bernal, J (Sep 16, 1997). "The type 2 iodothyronine deiodinase is expressed primarily in glial cells in the neonatal rat brain.". Proceedings of the National Academy of Sciences of the United States of America. 94 (19): 10391–6. doi:10.1073/pnas.94.19.10391. PMC 23373 . PMID 9294221. Prieto, M; Chauvet, N; Alonso, G (Jan 2000). "Tanycytes transplanted into the adult rat spinal cord support the regeneration of lesioned axons.". Experimental neurology. 161 (1): 27–37. doi:10.1006/exnr.1999.7223. PMID 10683271.